The Society of North American Goldsmiths (SNAG) advances jewelry and metalsmithing by inspiring creativity, encouraging education, and fostering community. We invite everyone to join SNAG – jewelers, designers, collectors, educators, students, metalsmiths and others. SNAG is for everyone with an interest in the art and craft of contemporary jewelry and metalsmithing. SNAG embraces all metals, multiple alternative materials, and different sizes and scale. As a member, you can connect with others while accessing information and images through Metalsmith magazine and the SNAG website. Get your work seen, benefit from discounts and scholarships, and much more. Be part of the SNAG jewelry and metals community: SNAG envisions a diverse jewelry and metals community engaging in thoughtful conversation and critical discourse while preserving tradition and embracing innovation. Online membership directory: Be listed and find other members. Quickly post opportunities on Springboard: Calls for entries, scholarships, employment, workshops, books, exhibitions, and much more. Connect with other members on Facebook, flickr, crafthaus, Twitter, YouTube, Instagram, Pinterest and LinkedIn: Scroll to the bottom of this page to connect with SNAG through social media. Volunteer: Since 1969, thousands and thousands of volunteer hours and talent have made us great. PEOPLE make SNAG work. Now’s a great time to get involved. SNAG offers a range of membership levels, from student to corporate. Below are the various options. Find the level that fits you. *A portion of your membership dollars go towards your Metalsmith magazine subscription. For example, $94 for a 1-year membership includes $34 for the magazine and $60 for membership. That’s only $5 a month in member dues! Student is defined as being enrolled full time or part time in any educational program to include college, university, technical college, community college, non-traditional school, and any other degree or certificate granting program. Student membership receives the benefits listed at the top of this page. but you want news from SNAG? an email every other month. 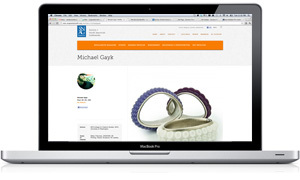 Get your Maker Profile page on snagmetalsmith.org and be seen by the movers and shakers in the business.